The core spreadsheets have been completely redesigned on the back end to load and respond more quickly. 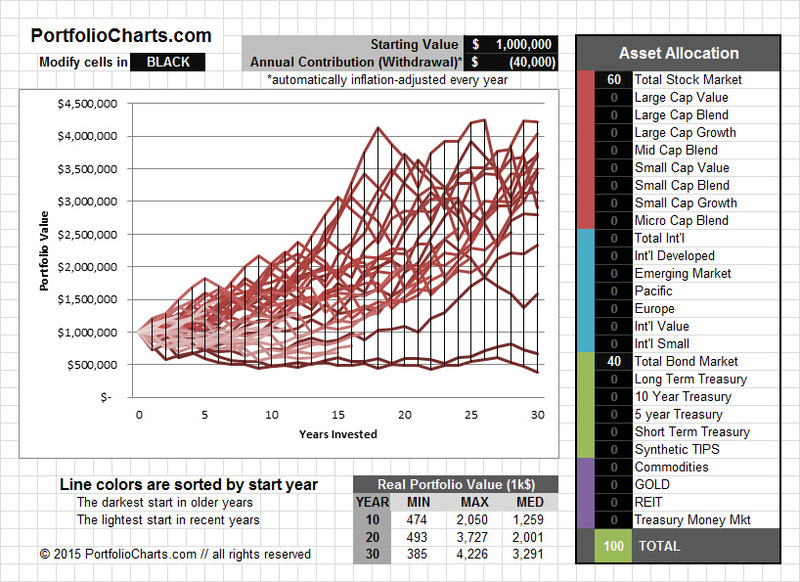 The Asset Allocation table has been significantly cleaned up. Descriptions are more clear, and assets have been sorted by type to make them easier to browse. A new bond option has been added to the list: 10-year Treasury. Several actively managed mutual funds have been removed, as they distract from the core portfolio indices. Separate calculators for popular mutual funds are a possibility for future development. The Expense Ratio has been added to the Asset Allocation table as a controllable input. After researching this in more detail, the change introduced an unexpected bug. For now, I’ve reverted to the previous data with no adjustable ERs, and the feature will go back on the to do list. The Hurricane chart has been lengthened from 10 years to 30 years. This will make it more useful for studying long-term goals like retirement withdrawal rates or saving for a college fund. Special thanks to everyone who has provided feedback on the calculators and site overall. If you catch any bugs or have any suggestions, please feel free to contact me.